The expo will feature more than 100 exhibitors and tons of great activities happening all day with something for everyone, even the kids! There will be a variety of workshops, classes, demonstrations, vendors, food trucks, a DJ, and more! Attendees can get the day started with Sunrise Yoga in the Park and enjoy additional Yoga classes and demonstrations throughout the day. The expo will also feature the 2018 MOVEment Games, a friendly fitness competition for people of every level of fitness. The cost to register for the MOVEment Games fitness competition ranges from $100 to $150, with all proceeds going to the Movember Foundation. There will plenty of fun games and activities for the kiddos as well, with a "Kids Fit-Pit" featuring a kid-friendly fun run, obstacle course, bounce house, & rock climbing wall. 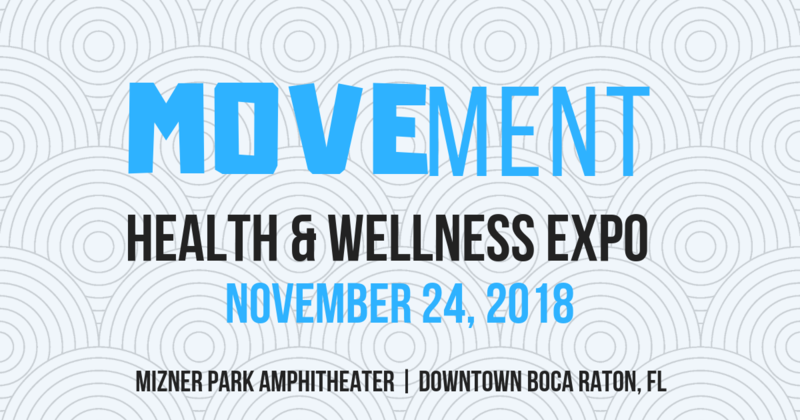 The MOVEment Health & Wellness Expo will take place from 10 am to 5 pm at Mizner Park Amphitheater, located 590 Plaza Real in Downtown Boca Raton, FL. Admission to the event is free and open to the public, with free parking available in the nearby designated parking garages. Click here for venue information and answers to FAQs. If you are health & wellness or fitness business professional and would like more information about becoming a sponsor or a vendor, please visit the MOVEment Health & Wellness Expo official page or email movementexpo@gmail.com. Be sure to mark your calendars for the inaugural MOVEment Health & Wellness Expo on Saturday, November 24th, 2018 & join the movement toward making a difference for men’s health. We at Champagne & Parisi Real Estate look forward to seeing you there!